12 Jan. 13 May. 12 Sept.
Let him make no distinction of persons in the monastery. Let not one be loved more than another, unless he be found to excel in good works or in obedience. Let not one of noble birth be put before him that was formerly a slave, unless some other reasonable cause exist for it. But if upon just consideration it should so seem good to the Abbot, let him arrange as he please concerning the place of any one whomsoever; but, otherwise, let them keep their own places; because, whether bond or free, we are all one in Christ, and bear an equal rank in the service of one Lord, “For with God there is no respecting of persons.” Only for one reason are we preferred in His sight, if we be found to surpass others in good works and in humility. Let the Abbot, then, shew equal love to all, and let the same discipline be imposed upon all according to their deserts. Not only is the excellence of obedience to be shewn by all to the Abbot, but the brethren must also obey one another, knowing that by this path of obedience they shall come unto God. The commands, then, of the Abbot or the Superiors appointed by him (to which we allow no private orders to be preferred) having the first place, let all the younger brethren obey their elders with all charity and vigilance. Let him make no distinction of persons in the monastery. Let not one be loved more than another, unless he be found to excel in good works or in obedience. Let not one of noble birth be put before him that was formerly a slave, unless some other reasonable cause exist for it. It is interesting to note that when the Goth brother lost the head of his billhook, he ran to Brother Maurus to confess his fault. Brother Maurus must have received his Goth brother sympathetically, because he forthwith went to Saint Benedict and told him of the mishap. Saint Benedict did not discount the poor Goth’s distress. Instead, Saint Gregory tells us, the vir Domini Benedictus, Benedict, the man of the Lord, left what he was doing, and went personally to the lakeside, took the handle out of the Goth’s hand, and put it into the water. The iron head floated up from the bottom and re–attached itself into the handle of the billhook. The Goth must have been wide–eyed. 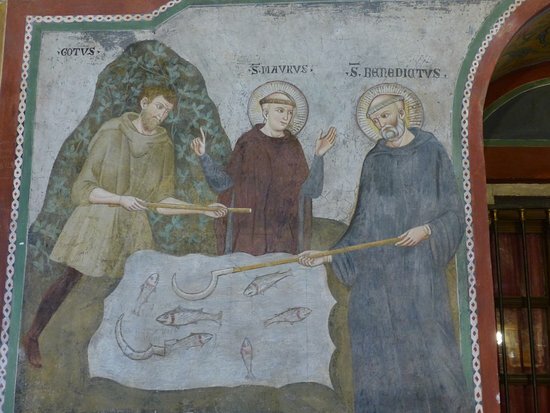 The most telling part of the story is what Saint Benedict said to the Goth brother: Ecce, labora, et noli contristari, “Behold, work on, and be sad no more.” An abbot must memorise these words of Saint Benedict and, in time of temptation, struggle, or discouragement, repeat them to his sons: Ecce, labora, et noli contristari. 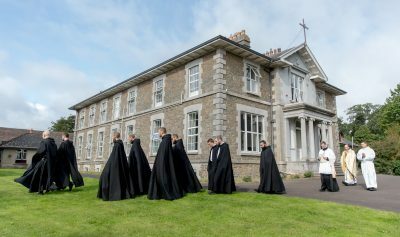 It is normal that during his noviceship, and in the first years of his monastic journey, a brother should struggle with renouncing his own will in order to practice obedience to the abbot and the brethren alike, knowing that by this path of obedience he shall make his way to God. Saint Benedict repeats in Chapter LXXI what he says in the Prologue: obedience is the path of our return to God. All our struggles with obedience come from pride. The prideful man holds to his own way of thinking; he wants things done in a certain way — his own way — and he has little patience with those who think and act differently from himself. He may become angry, or sad, or be tempted to withdraw from communication with the abbot or from the circle of fraternal life; all of these reactions are the symptoms of the underlying spiritual pathology of pride.